My puppy thrived on this product but as he grew and the feeds got bigger, the price of the food was too expensive. Whilst its a great product, with a 30kg puppy, I can’t afford it any more. My Cavoodle puppy Bob loves this food. Originally I had him on a vet product but it was way too expensive. Doing a comparison on the ingredients and the price this food is excellent value both money wise and nutritionally. My pup is very healthy and happy on this food. 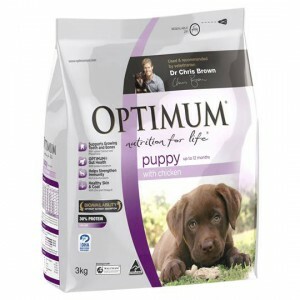 How would you rate Optimum Puppy Food Chicken?